NSS Group Review 2019: Is NSS Group a Good Hosting? NSS Group (NSS Int’l Co., Ltd.) is a long standing Taiwanese host with some bold visions. The plans come with a 99.999% stability commitment, but the downside is its premium price point. NSS Group (NSS Int’l Co., Ltd.) has been providing Taiwanese website hosting since 2001. It currently has more than 30,000 customers and has plans to expand its services into other Asian countries such as Indonesia, Malaysia, Philippines and also the U.S. The website is available in traditional Chinese, simplified Chinese, and English. 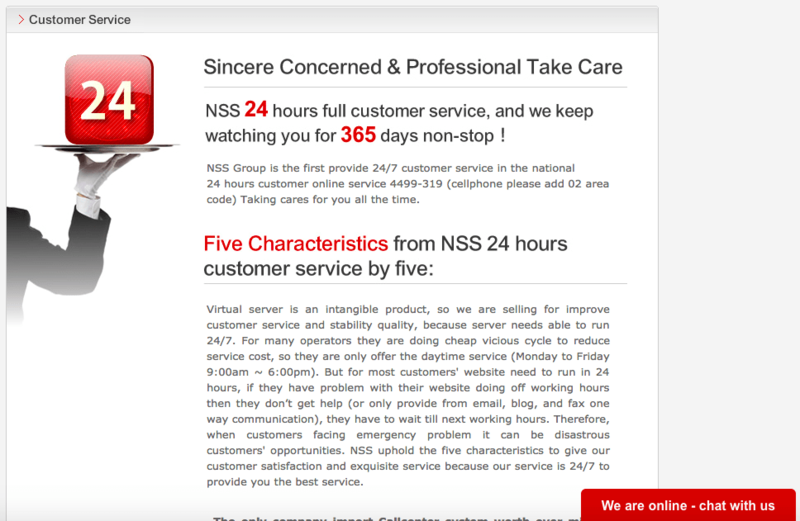 While NSS claims to be one of the leading Taiwanese providers, I can’t find any online sources to back that statement up. Nevertheless, it does offer some unique value add-ons not found at other companies. For example, it uses Hinet data center in Taiwan and offers a “5 nines” stability commitment, meaning 99.999% as opposed to an industry standard 99.9%. Although notably, it’s not a guarantee, nor is it an SLA. 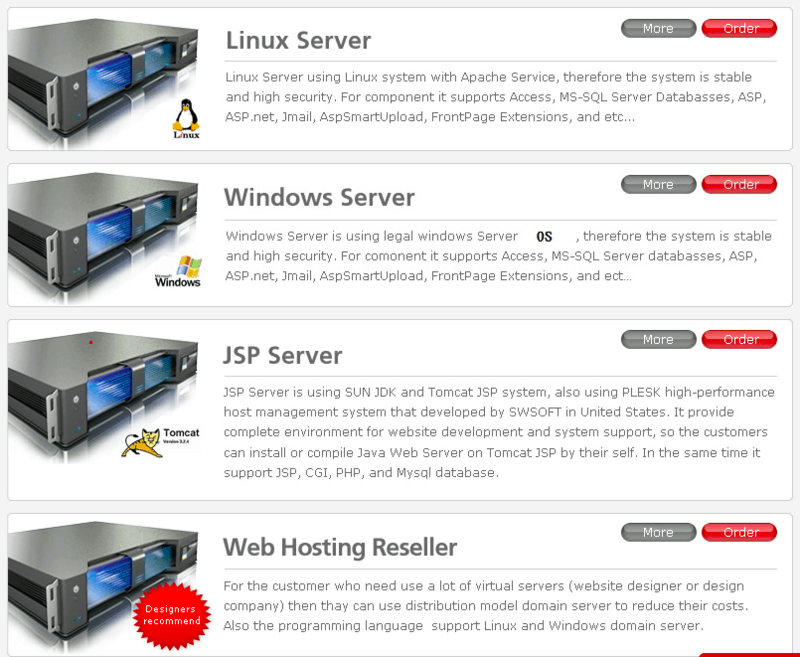 There is a choice of servers; Linux, Windows, and JSP. The Linux plans support CGI, PHP, JSP, MySQL, the Windows servers support Access, Microsoft SQL, ASP, ASP.net, JMail, AspSmartUpload, and finally, the JSP servers support CGI, PHP, JSP, MySQL, and PostgreSQL database. For ease of use, there is “Site Wizard” and the plans use Plesk, a reliable control panel, with 37 in built apps e.g., gallery, geeklog, gtchat, mambo, osCommerce, phpAds, phpBB, phpBook, phpBugTracker, phpsurveyor, phpwebsite, phpWiki, pLog, PostNuke, WebCalendar, WordPress, xrms, and so on. The servers use robust Intel Xeon processors, SCSI hard disks (Linux) or RAID 10 SAS hard disk drives (Windows and JSP), plus there’s a free CDN on all plans. The prices are quite high compared to international companies, however, in line with other Taiwanese providers. You do always need to purchase an SSL certificate, but you get a free .com domain name thrown in. Plans can only be bought in one year terms, which is strict, however, to counter this, there are some excellent payment terms such as a 30-day free trial, plus an anytime money-back guarantee, which is by far the most generous refund policy I’ve seen. Customer service is 24/7 by phone (various local numbers available including Hong Kong, Singapore, Philippines, Japan, Korea, Thailand, Indonesia, Vietnam, India, Australia, and the U.S.), an online ticketing system, and live chat. In my experience, when I tried to contact support via live chat, the link took me to a confusing client only area and I couldn’t figure out how to use live chat. In the end, I sent an email and unfortunately, despite waiting five business days, I did not get a reply. This is a far cry from it’s five hour response time promise on the website, however, I did email in English, so that could have been an issue. NSS has some grand visions, such as becoming the largest website hosting company in Asia and the most female friendly company in Taiwan. The business is long-standing and the plans include some nice value add-ons for beginners and experts, as well as some generous payment terms, the main caveat is that the prices are higher than I’d expect for the level of resources provided. Wondering how NSS Group stacks up against other Web Hosting companies? Enter any other Web Hosting company and we will give you a side-by-side comparison.